Health Aid Vitamin C plays an important part in maintaining healthy gums, teeth, skin, connective tissue and bone. It also acts as an antioxidant which may maintain blood cells and vessels. 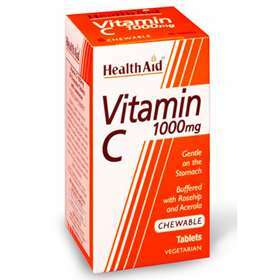 Health Aid Vitamin C is quickly absorbed and does not irritate the stomach due to added Rosehip and Acerola. Quickly absorbed by the body. Supports the formation of collagen and help in tissue repair. Free from Yeast, Gluten, Wheat, Starch, Soya, Dairy & Salt. Suitable for adults and children over 12 years of age. Take one tablet daily with food, recommend in the morning. Adults may increase up to three tablets daily if required. Tablets chewable or can be swallowed whole. Do not exceed recommended dose. Vitamin C (ascorbic acid, sodium ascorbate), Sweetener (dextrose, sorbitol, sodium saccharin), Rosehip Powder, Acerola Powder, Anti-caking Agent (stearic acid, magnesium stearate), Flavour Enhancer (orange neorome), Sipernat.